Even if you live under a rock, you’ve probably heard about cryptocurrency, bitcoin, blockchain or some other “latest craze” jargon. Cryptocurrency means different things to different people. Some people love it. Other people are afraid of it. And everyone else just scratches their head. Is there something to the cryptocraze that is sweeping through investing and gaming circles alike? This guide explores cryptocurrency (by talking about what the heck it is), blockchain, and then looks at how this technology is being adapted for use in video games. There’s a lot of action, a little bit of craziness, and a lot of interesting ideas. You don’t want to miss this. But here’s the other thing: No one really knows what’s going on with cryptocurrencies. The ideas sound good! But they are still uncertain investments. You should be ready to lose any money you invest, because that’s just how things could shake out. Cryptocurrency is digital currency. It doesn’t exist in a physical form (despite all the fun graphics showing refreshing minted tokens). It has no intrinsic value. It’s decentralized (there is no “central authority” controlling the supply–no banks or governments can artificially inflate or deflate the value or limit how much is available). There are also hundreds of cryptocurrencies available. Some of them are serious, others are less so. Cryptocurrencies were a byproduct to the solution for a tangential challenge. The creator(s) of bitcoin was trying to build a digital cash system that operated in a decentralized fashion (something people didn’t think was possible). What he came up with involved blockchain and bitcoin. Cryptocurrencies rely on a network of peers. Every peer on the network has access to the record database. This database shows every single transaction that has ever taken place, and also shows the balance of every account. Say Grognak gives 10 Bitcoin to Pipboy. That is a transaction. That transaction is authenticated by Grognak’s private key. The pivotal next step after the signing is the confirmation. This is where “miners” come into play. Miners confirm transactions. The miners need to solve very complex cryptographic puzzles in order to confirm transactions, and that’s when they’re rewarded with the cryptocurrency token (hence the “Crypo”…the currency-earning process is inextricably tied to cryptography). Once a block is added to the chain, every peer on the network then gets a record of this transaction. There are only so many coins that can be “mined.” And each coin is harder and more complex to mine than the last, which limits how many can be mined in a given time frame. There are several fascinating elements to cryptocurrencies and blockchain. One: Transactions can take place on a global scale almost immediately, regardless of the location of both parties–and it takes place more or less anonymously…Your real-world identity isn’t linked to your public key. All of your transactions occur under this string of numbers, known as a public key, but you can’t identify who the real-life person is just by looking at their public key alias. Two: Transactions are irreversible. Once a miner confirms a transaction, that transaction is recorded permanently, forever, for all time on the blockchain. There is no “undo” button. This permanence is both powerful and intimidating. No government, for example, could stop you from making a transaction in the cryptocurrency space, or restrict you from accepting a payment (beyond regulating your access to cryptocurrencies by blocking or restricting access to wallet software. A “wallet” is a program designed to let you hold your crypto coins in a safe, private digital space. With fiat currency (like the US dollar) the control over the supply and value of the currency is controlled by banks and governments. Even how you use your money within the system is controlled by banks and governments: frozen accounts, rejected payments, etc. They can lower the value by printing more money. They can adjust interest rates. All of these and more influence what your US dollar is worth. Cryptocurrencies are not impacted by governments or banks, unless members of either body purchase large quantities or sell their coins and impact the market price. But, the cool thing about blockchain technology is…if they do sell it or buy it, there is a public, permanent record of that transaction in the blockchain history of those coins. Let’s talk a little about Blockchain. Why Should You Care About Blockchain? Blockchain is different and exciting because the database it creates isn’t stored in a single, central location. Blockchain is completely decentralized, with the database distributed to every peer in the network. Every transaction is recorded in a new “block.” Blocks cannot be altered. Every transaction on blockchain is permanent, public, and protected from manipulation because of decentralization. Every transaction is stored everywhere at once, so hackers can’t target a single point and corrupt the data. To successfully manipulate the system, you would need enough computing power to override millions of machines hosting the database at the same time. And, every transaction is available to anyone with an internet connection. You can see “who” partook in which transactions. It’s easy to see how this is helpful in cryptocurrency. People are excited because blockchain could have a place in voting and politics. It could eliminate or mitigate voter fraud and election rigging. It could change the way companies, cities, states, or countries are run by building blockchain into the decision-making processes for these entities (and turning it into a more transparent collaborative process). And, of course, there’s the use of blockchain (and cryptocurrencies) in video games. 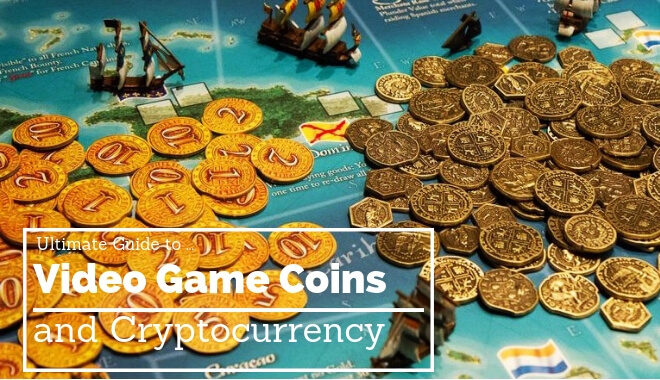 This element is especially interesting to us, so we’ll spend the rest of this guide looking at those potential applications, the video game-based cryptocurrencies that are emerging, and how coin creators, developers, and players could change the video game industry with this technology. Cryptocurrency and Video Games–What Are the Potential Implications? Before we get into specific video game currencies and platforms, we should look at the general ideas behind the push. 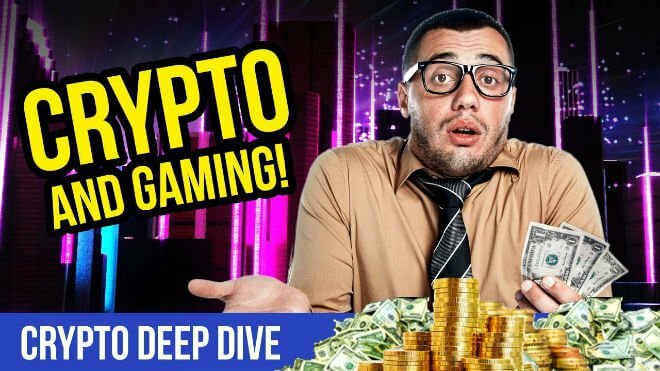 First of all, there’s a big crossover between the gaming audience and the cryptocurrency enthusiasts. This swollen-center Venn diagram has likely helped fuel the push for new incorporating cryptocurrencies into video games. Right now, some game devs are losing profits when players sell their unique skins or game items outside of the game on the grey market. To solve this issue, game developers and cryptocurrency builders are looking at creating assets you purchase in-game with crypto coins. This would mean digital assets that you actually own. You really want this sword cosmetic? Buy it with your Swordcoin* (*not a real coin…at the time of writing, anyway…) and voila, now you own that sword. It is yours. Picture the marketplace being similar to Steam. You buy a game with money, then you own it and it’s yours forever. With Coins, you’d pay for items with the specific currency and then you’d own it. You could sell it. You could use it. Or you could hang onto it as a memento. Developers could make games in the same universe and allow for items to crossover between the games. You could own a weapon and use it in multiple games. It’s kind of like the crossover from one game, like Mass Effect, where you can bring your character into the next installment. But instead of the same series, it’d be a completely different game. Enjin, the popular platform, is developing Enjin Coin as a way to tokenize in-game purchases. They pitch a really interesting example for the cross-game item compatibility we mentioned above. Say a developer creates two MMORPGs, one set in a futuristic sci-fi world, the other in a fantasy landscape. You would be able to play each game without the other. But, developers could create compound items that would need material from both games in order for players to craft them. The blood of a dragon and a mythril shard combined with a nova battery and a tractor beam lens could create some kind of impressive magic-meets-science weapon (oh, hello Asgard!). Then you could use the weapon in either game. And maybe in other games made by the same developer. And it would be yours. As a player, you could use it. You could hang onto it in your “wallet” as a relic of some of your best gaming memories, or you could sell it (or rent it!) for tokens to players who haven’t completed the challenge yet. There are even more possibilities: quests, stories, etc. that start you on a spaceship and end with you as a slayer of dragons. The ideas are still rolling in as developers and cryptocurrency inventors get more creative in realizing the full potential of cryptocurrencies and blockchain. Let’s talk about four of the more popular gaming-based cryptocurrencies. We’ll start with Enjin Coin. One of the biggest cryptocurrencies to see the light of day is Enjin Coin. Enjin coin is offered by Enjin, which is “the largest social gaming website platform in the world” with 19 million gamers, over 250,000 gaming communities, and reaching a ballpark of 60 million views per month globally. Enjin Coin is “An ERC-20 token supported by a powerful framework of open-source smart contracts and software development kits (SDKs)”. You may have heard about Enjin coin–they partnered with NRG eSports as a way to help spread the word about blockchain and crypto in gaming. And, the partnership is using ENJ coin technology to “reward’ their fans for participating in the technology. These custom-branded (since Enjin coins are customizable) NRG tokens can be redeemed by entering raffles and winning prizes. The coin itself follows an ERC-20 framework. That just means the coin uses Ethereum blockchain (an established cryptocurrency, largely regarded as the second biggest currency after Bitcoin). The ERC-20 Framework is a set of immutable “laws” that anyone looking to use the Ethereum Blockchain must follow. Enjin Coin provides the open-source SDKs for wallets and payment platforms for devs to incorporate the currency into their games. Enjin Coin is the platform with a vision for the cross-game item creation (magic-science weapon) but they have other interesting ideas, too. Enjin Coin talks about offering crowdfunding incentives in the form of digital assets so that studios can cut back on overhead costs for physical items. Crowdfunding rewards for bigger donors tend to be shirts, mugs, maybe an action figure or a collectible edition. Enjin Coin posits that digital assets could save the studio money. It seems like it could actually drive more engagement, too…Enjin Coin points to in-game items, currency, a plot of land, or extra character accounts as in-game rewards that could boost donor engagement. And, in some cases, these assets could work beyond that particular game, or have real-life value in the form of Enjin Coins on the marketplace. With blockchain the item wouldn’t just appear in your inventory, or locked on one saved game of one of your characters: it would be an accessible, transferable digital asset. The other idea Enjin Coin discusses with the power of blockchain is renting your character. If you have a high-end character in a game like an FPS, or really unique skins, or a rare weapon, you could rent this item out to other players for X amount of Enjin Coin per day. The other users could try it out (or use it to make their noob clan jealous), it keeps the item transactions in-game (as opposed to on the grey market), and the owner of the weapon gets to benefit from their hard work/long hours in the game. These are all interesting ideas…But they’re largely just ideas. The problem with Enjin Coin (and most budding cryptocurrencies) is that people don’t really know what to do with it yet. It’s in the early adoption stage. If and when this catches on, we could see really interesting crossovers of in-game items, lucrative rentals, players benefiting from the marketplace both in-game and fiscally, etc. But, for now, no one is doing this. No one knows for sure if cryptocurrencies will catch on, or if blockchain technology will work its way into video games officially. The other issue is, if crypto and blockchain do catch on in video games, which one will win out? Will we have one universal cryptocurrency for gaming? Or will we always have as many as we do now? What about dips in value? How do devs and players determine the price of items? Both in cash and in Enjin Coin? There are a lot of unanswered questions that don’t just plague Enjin Coin, but all cryptocurrency creators in the video game sphere. That being said, Enjin Coin has 756,192,535 coins circulating at the time of this guide, with a USD market cap of $86,277,787. You can purchase Enjin Coin via Okex and Binance, both of which are linked from the Enjin Coin website. The current price in USD was $0.114095 per coin, with a BTC price of 0.00001420 (for those paying with Bitcoin) and 0.00022467 ETH price (for those paying with Ethereum). These prices will fluctuate all the time, so check back here for the latest numbers. The GTCoin is another coin on the ethereum blockchain. It’s run by Game Tester, which is designed to facilitate collaboration between games devs and players by, you guessed it, testing games. Through blockchain,Game Tester users will be able to assign specific access to games via GTKeys. The keys will limit the in-game playability to hone in on what the devs are hoping to test, and limit the timeframe in which the game can be tested. These keys also make it easy for players to buy the games they test as soon as they come out. As a player, the Game Testerplatform will actually reward your time with GTCoins. You’ll get “first” access to new games, and you’ll also have the opportunity to earn prizes and rewards if you engage with the platform regularly. Developers can get valuable feedback for their games, they can build excitement for their games, and they can release their games confidently knowing these factors are in place. GTCoin suffers from the same pains as all cryptocurrencies: there’s no way to guarantee success or value. If GTCoins end up being worth fractions of a cent, the player appeal for testing games plummets–where’s the incentive? But, if GTCoin takes off, they have a strong case for recruiting players and game developers alike. At the time of this guide, GTCoin is valued at $1.10 USD. You can purchase coins from your GTCoin wallet after creating an account. They have options for volume bonuses and extra bonuses for those who HODL their GTCoins. HODL is used a lot in the cryptocurrency world and just means holding your coins instead of selling them. GameCredits does not beat around the bush when it comes to their aspirations: they want to be the universal blockchain-based digital currency for video games. GameCredits plans to offer extra value for players when they use the currency to make in-game purchases. Any credits earned in one game would also be transferable to another. For developers, GameCredits is offering 90% revenue margins through their mobile gaming store, GPlay. That’s a 20% increase over the 70% percent offered by the other stores in the industry. They recently partnered with Unity Technologies, “the world’s number one game-development platform, with 770 million titles made using its engine.” They also boast that 340 of the top 1000 free mobile games used Unity tools. The second most popular platform has 180 on the list. The partnership with Unity makes this a digital currency to watch. Their goal is ambitious and they mention it several times. They want to be the universal gaming currency. So what happens if they fail in that endeavor? What happens to the value of the coin? Aside from being subject to the same cons as the other currencies, GameCredits say they’re going for total dominance in the video game world. What could the losing conditions look like? You can purchase GameCredits through the G Wallet. At the time of writing the currency was worth $1.62 USD per coin. There were 64,355,352 GameCredit coins in circulation. And, if you’re so inclined, they also have options for mining through their GShare BETA app. The idea behind Crycash is that gamers can earn the currency by competing challenges in the game. Instead of unlocking an “achievement” for satisfying certain in-game criteria, you’ll be rewarded with actual currency which could be used for in-game purchases and more. The creators hope this will incentivize gamers to play more games and ultimately lead to bigger audiences for developers. Crycash will soon be integrated with Warface, a free-to-play first-person shooter. Crycash shares the same cons as the other coins. There’s just no way to tell how it will perform, but the idea of rewarding players for in-game challenges is an interesting idea. You can purchase Crycash (CRC) on sites like YObit.net, LIVECOIN.net, and IDEX. They’re looking to add more purchasing platforms, soon (Binance, Okex, etc.). We included Pocketful of Quarters to show you how cryptocurrency really can be for anyone. This company, founded by a father and son, has the son, a 12 year old, for a CEO. It was the son’s idea, stemming from frustrations based around losing all his coins when quitting out of games. Unlike other cryptos, Quarters is not looking for investors. Quarters are used purely for playing games. They’re an ERC-20 coin, they have 10+ games and 100+ players using their for-games-only cryptocurrency. It’s hard to say where this will go. The world is still adjusting to cryptocurrencies. It’s very different from any trading system we’ve had up until this point. People are still feeling it out. But the clever ideas are starting. We talked about mixed-world items, quests, and stories, which might have your mind buzzing with interesting Ready Player One possibilities. You can buy property on this virtual reality platform that relies on the Ethereum blockchain for record keeping. Because land is purchased through blockchain, you have full, permanent, public ownership of your virtual plot. And the world lets you build upwards with no limit (that’s right, no zoning restrictions!). It’s a pretty wild concept. It’s hard to predict if or when this will catch on…Or how this kind of immutable ownership of property could transfer into other games, like an MMORPG. What if players could buy a shop in a game for coins/tokens and then “run” that shop in game by selling their own in-game assets? Or even assets for other games that take the currency? How long until we’re all living in a virtual reality? Our very own Oasis? Or are we already in one?